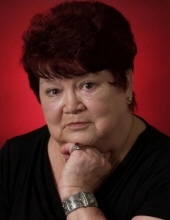 Nancy Carrol Cole Dix, 77, of Ansted passed surrounded by those she loved on Friday, April 12, 2019 at CAMC Memorial. She was the daughter of Otho and Ruth Bartrum Cole. She was preceded in death by her parents; her husband, Bobby Joe Dix; a daughter, Renee Boggus; and a son, Scotty Dix. She is survived by daughters: Felicia (Allen) Hart of Ansted, and Cheryl Dix of Ansted; sisters: Hester “PeeWee” Trent of Ansted and Nora (James)Miller of Ansted; brothers, Ronnie Cole of Ansted, and Charles (Beckly) Cole of Beckley; a daughter-in-law. Shirley Bryant Dix; grandchildren, Justin Boggus, Matthew Dix, Ruth ashton Dix, Bobby Jean Dix, and Summer Boggus; and 6 great-grandchildren. She was a loving mother. A graveside service will be held at 2:00 p.m. Monday, April 15, 2019 at Restlawn Memory Gardens in Victor, WV with Pastor Ron George officiating. To send flowers or a remembrance gift to the family of Nancy Carrol Dix, please visit our Tribute Store. "Email Address" would like to share the life celebration of Nancy Carrol Dix. Click on the "link" to go to share a favorite memory or leave a condolence message for the family.